The Clarke Sports Tennis demo program puts you one step closer to finding your perfect racquet. We ship everywhere in the Continental United States, so tennis players from all over the country can demo our racquets and decide on the perfect one for their style of play. Demo up to 4 different racquets of your choice for up to 7 days. *A credit card with CVV code on the back is required for all Demo racket orders. *Most demos are available in 4 3/8 grip size. *We can only ship to a physical address (credit card billing address); we cannot ship to P.O. BOXES. We will ship all demo racquets from our warehouse here in Houston, Texas via UPS. You will be e-mailed the tracking number when they ship. You should receive your demos in 2-3 business days of shipment. You have one week from the day you receive the demos to use them until they need to be returned. So, if you received the demos on a Monday, you will need to ship them back the following Monday. Return the demos in the original box, affix the enclosed UPS return address/shipping label, and drop the box off at one of the thousands of conveniently located, manned UPS Store locations. DO NOT leave the Demo racquet box outside any other unstaffed shipping facility. Use UPS Stores only if available in your area. 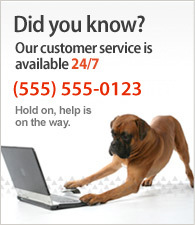 For questions, call our Customer Service department at 1-800-777-3444 and they will be happy to answer any questions you might have. There are no additional fees for racquets returned on time. As a courtesy to all our customers, demo racquets need to be returned on time. CST will send you a reminder e-mail prior to the return date. If the racquets are shipped back late, you will be charged $3.00 per racquet, per day that it is late. If we are not able to reach you after 7 days overdue, your credit card will be charged the full retail price for each racquet. Please return them on time and keep proof of mail-back date for verification in case there is a delay in them reaching us in a timely fashion. Enjoy using your Clarke Sports Tennis Demo racquets!